Today I’m going to be doing another “shop my stash” type of post! I wanted to share my current “everday” Z-palette. I just have a small one since I am more of a palette kinda gal, but I have been reaching for these shadows often the past month when I need something simple, yet quick to put on my eyes. I have a go-to style when it comes to shadows. I like a bold crease, bright lid, and dark outer corners. I just find it’s flattering to my eye shape, and these shadows are fool proof for creating that. Makeup Geek “Bitten:” This is one of my all time favorite single shadows right now. It’s so pigmented and smooth, and is a gorgeous burgundy color. I feel there are a lot of burgundy shades that aren’t very pigmented or are a bit too dry, but this one blends wonderfully. Morphe’s “Creme Brulee:” Not to be mistaken with Makeup Geek’s Creme Brulee, this shade is super dark and cool toned. I love it though. I think that an everyday fall look for me will probably always include either dark browns or red tones, and this one is really lovely, and very affordable! Morphe’s “Deep Cocoa:” I’ve been wanting this shade for awhile since Jaclyn Hill uses it often, and it’s such a pretty red toned brown! I’m obsessed with red toned browns, but my other favorite one is in the Revealed 2 palette, and deep cocoa is nice to have in my Z Palette on days when I don’t want to dig through a million palettes to create a look. Morphe’s “Caramalized:” Very pretty warm brown shade. This looks pretty in the crease as a definer or as a transition shade if you use a light hand. There’s not much I can say about this shade other than it’s one that I felt completed this palette. Morphe’s “Pink Moscato:” Ah, the only shimmery shade. Honestly, I don’t need any other shimmers in this palette with this shade front and center. I am a sucker for pink shimmery shades because you can wear them with cool toned looks or warm toned looks. This shade is super pigmented and very buttery to the touch. One that I highly recommend ordering if you love a glamorous lid for Fall. Morphe’s “Secretive:” Another shade I wanted from the Jaclyn Hill favorites palette that I never snagged. However, this shade disappoints me a bit. It’s still very lovely, but as you can all probably see, it swatches a bit patchy. Now, it does perform way better on the lid, but if I had to choose between this and Makeup Geek’s Bitten, I would choose Bitten. 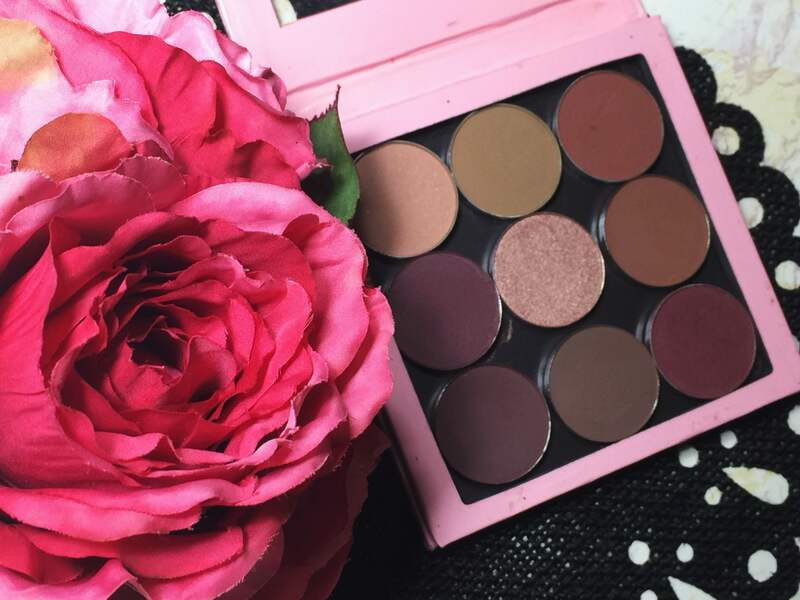 Makeup Geek’s “Cocoa Bear:” This is a cult favorite, and rightfully so. It’s the perfect orange toned brown shade. I know that once upon a time I said I didn’t like warm tones, but lately they’ve been growing on me. This past year has been one of enormous growth for me makeup wise, and I feel like I can comfortably wear warm tones…and if they make me look sick…okay. Ha! Makeup Geek’s “Preppy:” The perfect shade of baby puke! I’m kidding, but not really. This is one of those odd khaki shades that is weirdly appealing. I have a thing for tastefully tacky shades of eyeshadow, and this one is still very lovely in the crease. 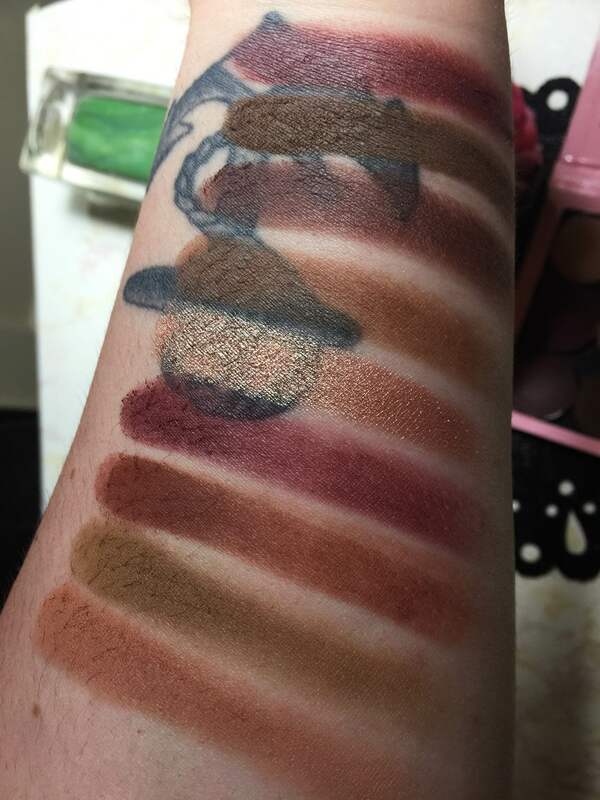 Makeup Geek’s “Creme Brulee:” My holy grail transition shade. If I don’t know what to transition a look with, I usually reach for this one. It’s one that I recommend for anyone with fair skin. It’s the perfect undertone that isn’t too orange or cool toned, and it will easily blend away in a look if you need it to. I’m actually surprised I haven’t hit pan on this one yet! This is an example of an everyday fall go-to look for me. Shimmery shade, warm crease, and dark outer corner with winged liner and lashes. I know that this is a lot to many people, but I’m a very “all or nothing” kind of person I guess. Anyway, that’s it for today’s post! I hope you all enjoy these little peaks into my stash! As always, thanks for reading, and I hope you’re all having a wonderful weekend filled with pumpkin spice whatevers or apple cider thingies. This looks like a lush little palette! Trying to get braver and venture into warmer colours and more dramatic eye looks – just need to get a little braver (and watch a few more tutorials!) This might just be a potential first autumn buy for me! Oooh girl those are perf for fall! I esp love the Pink Moscato and Bitten! Now if someone would only make this palette purchasable – I would buy it! Love Love looooove!!!! Even though I have the JH palette .. I think I’m totally going to end up purchasing each and every shade you just mentioned. This looks like such a gorgeous fall/winter palette !❤😍😍😍 I can’t take my eye off of pink Moscato ..even the name is spot on!! I really need to buy some makeup geek eyeshadows. they look really amazing quality. I love customizable palettes! 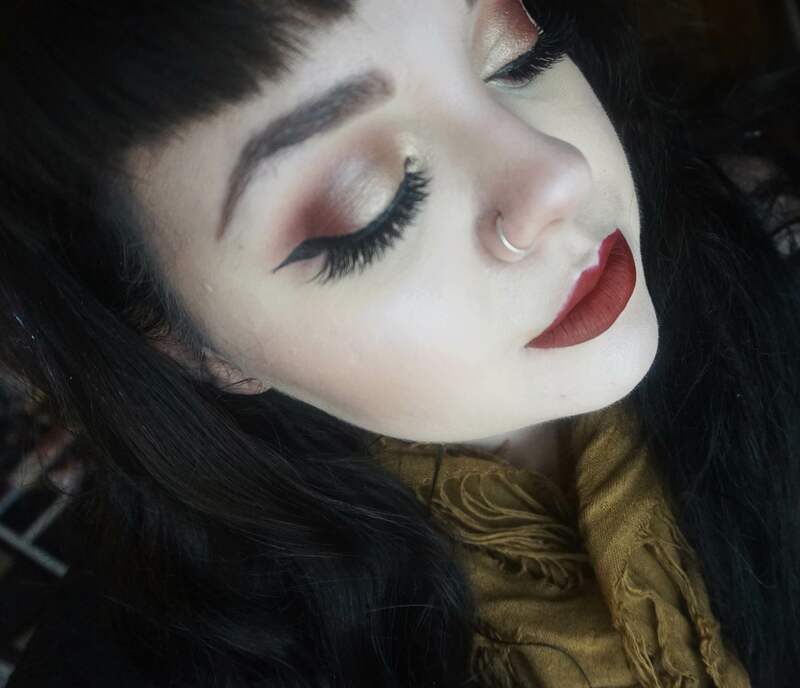 Your everyday Fall palette is AMAZING! This should be made into a real palette – it’s got the perfect mix of shimmers and mattes and gorgous rich Autumn tones. Well done! Thank you! I would love for this to be a for real palette, but I guess that’s the joy of single shadows at times! I can create my idea of a perfect palette. Pink Moscato is so beautiful! I have way too many palettes in general haha. I think someone should! I see so many Morphe palettes released and I’ll fall in love with about 5-10 shades but rarely am I ever in love with every shade like I am with this z palette!